Pork tacos with black beans covered in cheese and salsa anyone?! Delicious!! 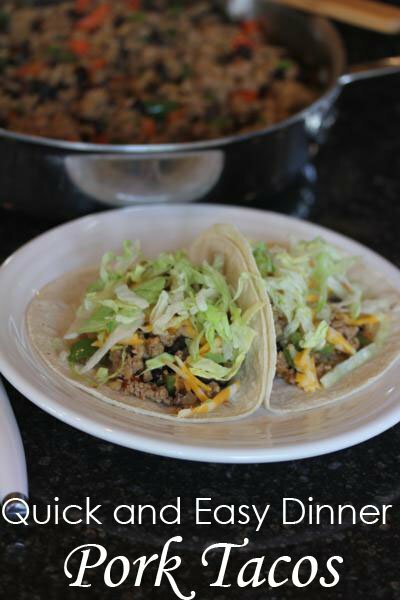 I recently changed up taco night and made them with ground pork instead of ground beef and we loved the flavor it gave the tacos. I have no clue why I have not thought of this before. I love making simple changes to favorite meals that change it up just enough to make us feel like we are eating something different, but not enough to get any complaints. Pork tacos will be on the menu often at our house. 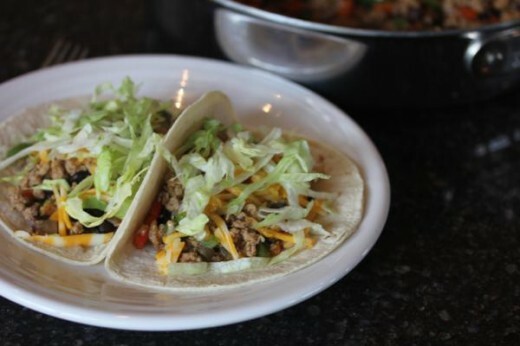 They are quick and easy to make and are a fun way to change up taco night. 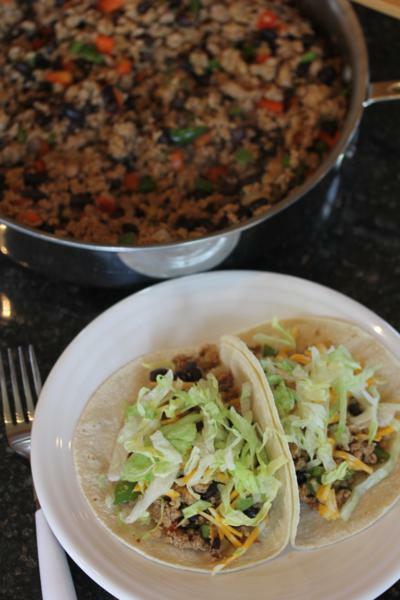 Have you ever tried ground pork for your tacos? In a skillet cook pork and onion until pork is browned and onion is tender. If your pork is really lean you may need to add a little oil. Add beans, garlic, and taco seasoning and cook until heated through and mixed well. Serve on tortillas with cheese, sour cream, salsa, etc. I made this for dinner tonight and everyone loved it! I really liked the addition of the beans, because it stretches the meat (we are a family of six) and the kids didn’t care that they beans were in there! I used my own recipe for taco seasoning and it worked perfectly. Many taco seasoning are not gluten free. I have been making my own and it is very good. Yes you are right a lot of taco seasoning does contain gluten. I usually write that in the recipe and did not have it in this one. I just updated it to say to use gluten free or homemade taco seasoning. I often make my own as well. It easy and you can control the ingredients when you make your own.